Every year, I try finding a new angle to talk about this day, September 11th, and what it means to myself and our nation. Thirteen years ago, two airplanes crashed into the World Trade Center towers in New York, one went into the side of the Pentagon and one into a field in Pennsylvania. My father was driving to the Pentagon that day for a meeting he had and it was supposed to be a regular day. I was in Pre-School, 5 years old to be exact, and my mom suddenly came and got me from school. I had no idea why or what was going on. Next thing I know, I was at home and I saw my mom sitting in front of the TV screen, watching what I would later know as the first two planes hitting the World Trade Center. My mom wasn't sure what was going on and so she called my father who was already driving to the Pentagon and she told him to come home. She had a weird feeling and was preferring that he came home immediately during this time. This call from my mom may have saved his life. What felt like a half hour later, the next plane hit the Pentagon and my mom let out a sad sigh of relief. It was a tragedy knowing that so many people were losing their lives yet by a chance of luck, my father was able to avoid this and arrive home safely. To be completely honest, I never know how to write posts such as this. What am I supposed to talk about when it deals with a national tragedy? It's always a difficult topic to write about, yet sometimes the best things to say require the least effort. I found this prayer by a Navy Chaplain in regards to 9/11 and I feel like it is well worth the share. "Almighty God, the past year will be indelibly inscribed in our memories. We looked with horror on the terrorist attacks of last September 11th. But we looked with honor on acts of courage by ordinary people who sacrificed themselves to prevent further death and destruction. We shed our tears in a common bond of grief for those we loved and lost. We journeyed through a dark valley, but your light has led us to a place of hope. You have turned our grief into determination. We are resolved to do what is good, and right, and just. Help us to remember what it means to be Americans— a people endowed with abundant blessings. Help us to cherish the freedoms we enjoy and inspire us to stand with courage, united as one Nation in the midst of any adversity. 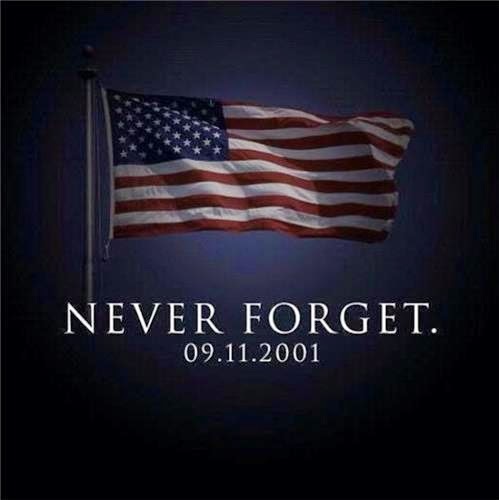 We shall never forget the horrors of this day and all the lives that were lost. We as a Nation will only get stronger and will always be there for one another during these tough times. Keep those who have fallen in your hearts. Trivia Tuesday: What's this "Twitter Tag Game"? Walk the Plank Wednesday: What to Improve? Six years... Time flies when you're having fun!